It is possible that 9News would say that one should not believe the rantings of a passionate activist, that perhaps she read into this what she wanted to hear. That all would be a consideration if Garcia’s piece did not use such inaccurate information. That would be true if he had spoken with the Jefferson County School District, which Complete Colorado says never happened. What this means is that Nelson Garcia may have taken the word of the recall activists armed with an agenda over doing a quick Google search or calling the school district, which would have been the ultimate source for the information. Further, Garcia apologized to the recallers for his performance on 9News‘ Balance of Power? Apologized for what? For not carrying their water? That’s not his job as a journalist. His job is to fairly present the facts, which he seems to be having difficulty doing. 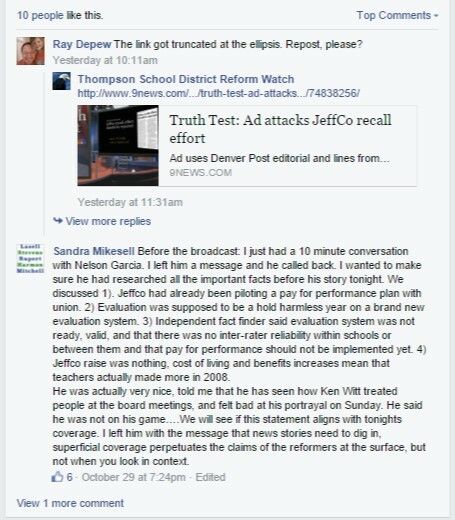 Complete Colorado asserts that 9News will not reveal its sources for its (Un)Truth Test. Is that because the only source 9News used were the recallers? 9News needs to do an on air correction and, if there is even a kernel of truth to this, Garcia needs to be fired. If 9News really considers itself an unbiased news source, and one as dedicated to the community as it claims to be, there is no other option. Nothing? That's what I thought. Thank you for publicizing all of the points that I wanted Nelson Garcia to make. He did not cover them all with enough depth, but your article just did that for me. A heartfelt thank you!!!!! Please share any credible source that refutes any of the points above. You will not be able to. ALL are factual, unlike the Koch sponsored AFP commericals. All I ask is for you, anyone, to provide the evidence that any of the four points are incorrect or invalid in any way. The *only* argument that can be made (and made honestly) is the off-handed comment that the raise was "nothing" … true, $30 per month is not "nothing" but it sure isn't much for the ONLY raise received since 2008 and is far less than even Cost of Living Adjustments (ONLY, and no "raise"). I'll take Nacho Libre Ken Witt over AFP-backed Ken Witt 10 times out of 10. This comment is offensive and from a fake Facebook account to smear Ken Witt who would not use the language contained in this comment. I continue to be impressed with Colorado Peak Politics and their relentless hammering of the libtards. Remember people, what's important is not the truth. What's important is that we make the libtards look like the dishonest union thugs that they really are. In these final hours before the election, we must keep up the attacks.